Revoke space administrators access to ScriptRunner Built-in Script features in the space they administer. Space Administrators now have access to certain Built-in Scripts that enable them to better manage their spaces. 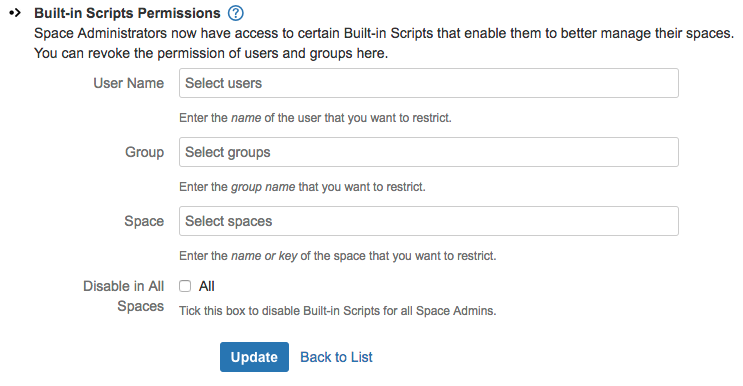 Confluence System Administrators have full control of space admin’s Built-in Script access and can revoke permissions for users, groups and spaces. It is also possible to disable space admin Built-in Scripts for the entire Confluence instance. User Name : Enter the names of the users which will have their access to space Built-in Scripts restricted. Group : Add the groups of users which will have their access to space Built-in Scripts restricted. Space : Add the space names to disable Built-in Scripts for these spaces. Disable in All Spaces : Selecting the check box will disable space Built-in Scripts for the whole confluence instance. After adding the values click Update to save the permissions.